Wera 073232 | Wera 8002C KOLOSS ½" SB with ½" Drive. Wera 8002C KOLOSS ½" SB with ½" Drive. 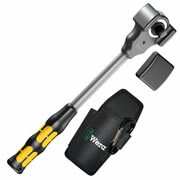 Wera 073232 Wera 8002C KOLOSS ½" SB with ½" Drive. Wera 073232 8002C KOLOSS ½" SB with ½" Drive. Ratchet function for 1/2" square sockets and 1/2" adapters with square drive, equipped with ball lock, hammer function e.g. to align work pieces. Push-through square drive for forward and reverse operation, fine-tooth ratchet mechanism, small return angle of 6°, can transfer at least 600 Nm of torque, tubular shaft to minimise impact vibrations, drop-forged hammer head, positively pinned with ground striking face. Multi-component Kraftform handle for optimum pressure, impact & tensile loads, handle end designed for connection of KOLOSS extension 8780 C & KOLOSS centering pin 8781 C.